On our Caucasus tour this autumn, we only had one week to spend in Armenia due to dental operation that “forced” us to stay in Georgia longer than planned. Even though Armenia is not very large country, just one week is not nearly enough for exploring it thoroughly. So we decided to focus only on the capital, and save traveling around the country (and hiking) for the future. For sure we’ll be back in Caucasus some day. But yes, Yerevan. It’s busy and bit confusing at first, but actually quite charming after all. It’s a city of contrasts, a delightful mix of old traditions and new trends, and has a quite European feel. Yerevan is an ancient city with interesting history, and actually it’s one of the oldest constantly inhabited cities in the whole world. Quite interestingly though, most of the structures there are not older than from the 20th century, when the city was turned from a small town to a metropolis and many historical buildings were destroyed. 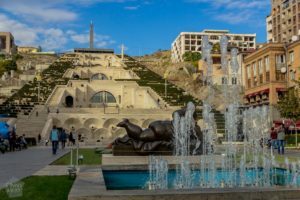 Wide main streets, large squares and monumental buildings are typical Soviet era architecture, that in Yerevan is accompanied with lengthy park strips with small ponds, fountains and statues. 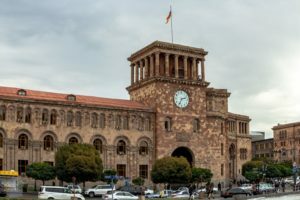 With estimated population of 1,2 to 1,3 million, Yerevan is a relatively big city, and in fact over one third of all the population of Armenia lives in the capital. In this post we shortly introduce the main sights of the city, and provide tips for planning your visit in this spectacular city. 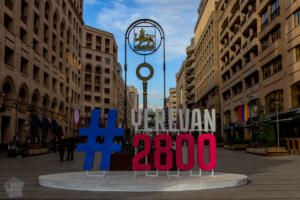 In addition to wandering around the city, we participated in Yerevan 2800 years anniversary celebrations, and met with a fellow Finn Ilkka, who has lived in Yerevan for 8 years, and he introduced the city to us. Highlights of the stay included also our visits to Armenian restaurants, and we even managed to (finally!) find great local craft beer. To keep things balanced, we also went running in the parks around the city center, and exercised in a local gym. 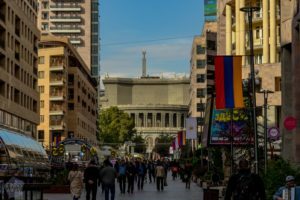 Probably every sightseeing tour ever made in Yerevan includes the Republic Square, and it actually is hard to avoid this huge, centrally located square. The design of the square was a central part of an urban city plan called the General Plan of Yerevan, developer by Alexander Tamanian and approved in 1924. Republic Square was originally named as Lenin Square, and there was a huge Lenin statue, until it was taken down after the collapse of the Soviet Union. The huge buildings surrounding the square were built by 1950’s. The pinkish stone used in buildings here and also elsewhere in Yerevan is called tuff, sometimes also (incorrectly) tufa. It’s a type of volcanic lava stone, that looks like it’s changing it’s color depending on the lighting, being the most pink at sunrise and sunset. Tuff stone bricks are not all the same color, which gives the buildings a vivid, multi-colored look. Due to the huge amount of rose tuff stone buildings, Yerevan is sometimes called as the Pink City of Armenia. The buildings around the square include State History Museum and National Art Gallery, Governmental Buildings, the Post Office Building, and the former Armenia Hotel Building, nowadays home to Armenia Marriot Hotel Yerevan. On top of admiring the architecture, people gather to the square in the evenings (from early spring to late autumn) to watch the singing and dancing fountains. 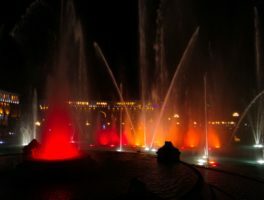 The fountains, originally designed by Abram Abramyan in 1960’s and renovated and re-opened in 2007 dance along with classical, traditional, pop and rock music and a lights of course. The show, performed between the sunset and 10 pm, is pretty amazing, warm recommendation to go and see it! Heading northeast from the Republic Square along Abovyan Street, you’ll find the largest pedestrian street of Yerevan. The Northern Avenue runs north all the way to Freedom Square. The avenue was already in Tamanians city plan, but not constructed until year 2002. It’s home to luxury boutiques and fashion brand stores, hotels, office buildings, cafes and restaurants. Strolling along the avenue seems to be popular hobby, and it leads nearly 500 meters to the Opera House and surrounding park with idyllic outdoor restaurants and cafes. The Yerevan Opera Theater is a massive structure in the north end of the Northern Avenue, also part of Tamanians city plan. It was opened in 1930, and consists of two concert hall; the Aram Khatchaturian concert hall and the Alexander Spendiaryan Opera and Ballet Theater. The huge, staircase like structure in the northern end of central Yerevan, behind the Opera House is called Cascade. The giant complex connects the downtown with the residential areas on upper levels, and consists of not just stone steps but multi-level building and impressive fountains and sculptures. From the top of the structure, reached either along the stairs or using the escalators inside, it’s possible to see the Mountain Ararat on the Turkish side of the border, and there are great views over the city. Inside the stairwell, and partly on the landings on the way up, is the Cafesjian Center for the Arts. Galleries of the museum hold a collection of glass artwork, paintings and sculpture, with both permanent and temporary exhibitions. Entrance fee (for adults) to exhibition galleries is 1000 AMD, so less than 2 €. The park, or more like a garden below the stairs is yet another part of the Cafesian Center, and also full of art in form of sculptures and statues. It is also sometimes a venue for concerts and other performances. 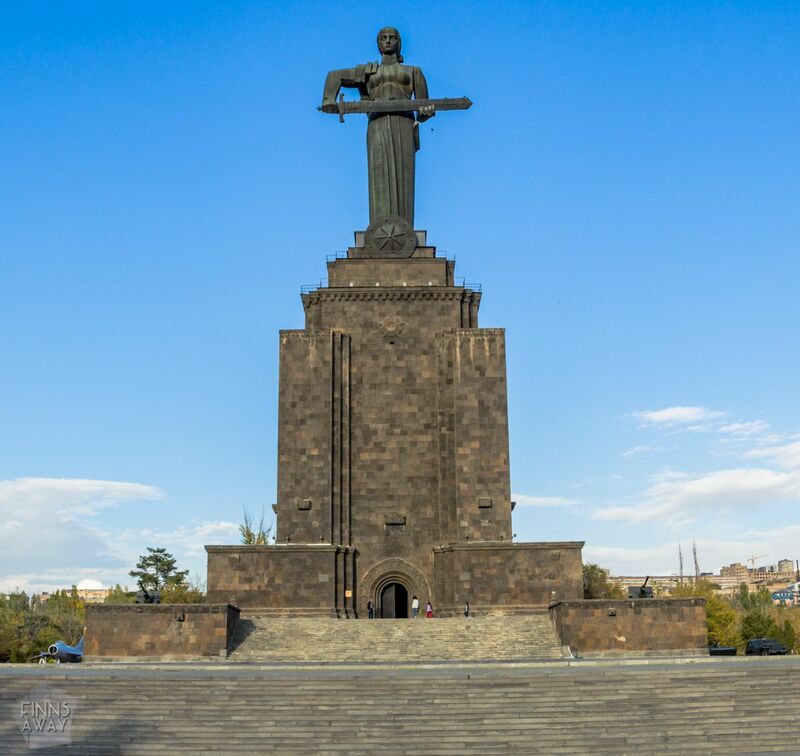 When on top of the Cascade, don’t skip the Victory Park with the famous Mother Armenia Statue. First climb to the concrete platform on top of the Cascade, with the towering monument for the 50th Anniversary of October Revolution, and then head to the highway underpass that leads to the park. The Victory Park (Haghtanak Park) itself is quite poorly maintained, and there is a bit creepy old amusement park, that looked almost abandoned in October, but sees a lot of visitors during summer. 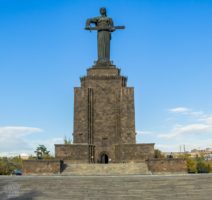 The highlight of the park is the gigantic Mother Armenia statue, with Military Museum. When the museum first opened in 1950, it was topped with a statue of Stalin. 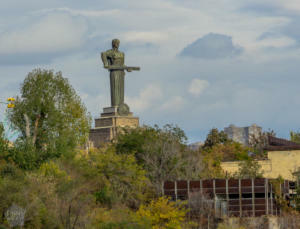 17 meters high statue was in 9167 replaced with symbolic statue of Mother Armenia holding a sword. Entrance to the museum is free, but donations seemed to be more than welcome. Armenia is strongly Christian country, but during the history it has been under the rule of Islamic empires. There was several mosques in Yerevan still early 20th century, but all of them were closed during the Soviet rule. 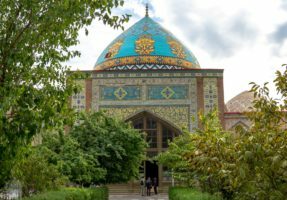 The Blue Mosque on Mesrop Mashtots Avenue was originally build on 1765, and re-constructed in 1990’s. It’s the only operating Shia mosque in the city. When visiting, remember to dress appropriately. 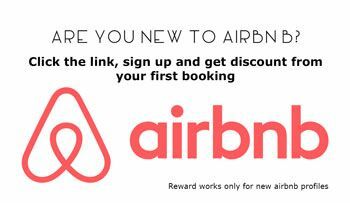 Finding accommodation should be easy in Yerevan. There are plenty of hotels, and nowadays also hostels available in the city center. 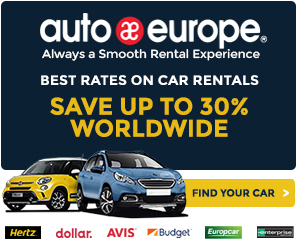 The most affordable options are a bit outside the busiest center. We stayed in recently opened Thailand Center, near Russia Mall and Zoravar Andranik Metro station, and almost next to majestic Saint Gregory the Illuminartor Cathedral. Thailand Center is a clean and nicely decorated budget option, with both private rooms and dorms, and a kitchen in use. Even if you only have few days in Yerevan, make some time for getting to know the local cuisine. Armenian kitchen is a unique mix of influences from Arabic, Persian, Greek and Russian traditions. Traditional cuisine lies heavily on barbecued meat, with fresh vegetables and herbs. Kebabs are common, as well as thick stews. Lahmajos, thin “pizzas” topped for example with spiced minced lamb and tomato, are popular quick eats in local restaurants. Armenians drink a lot of coffee with sweat deserts like baklava, and national liquor is Armenian cognac, known as konyak. Regarding Armenian craft beer, we were positively surprised after finding Dargett brewpub and their selection of quality brews. More about that will follow in a separate post about our craft beer hunt in Caucasus. 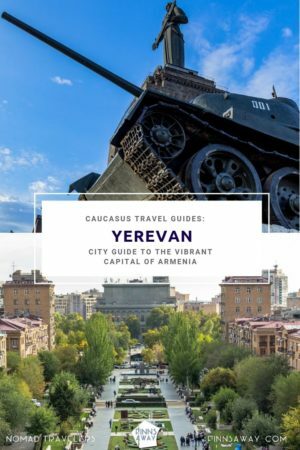 Most of the tourists visiting Armenia either fly to Yerevan, or travel overland from Georgia. Borders with Azerbaijan and Turkey are closed, but there are long-distance buses to Iran from Armenia. If flying, you can reach the Yerevan city center by taking a local bus (or taxi of course) from the airport. Coming from Georgia, there are several daily bus (or van) connections between Tbilisi and Yerevan, and also a train. 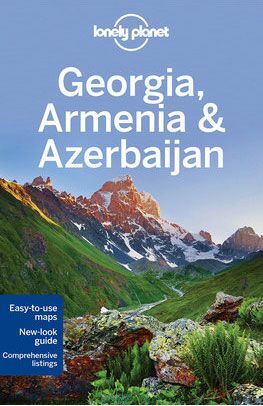 Another easy option is to travel via Gyumri from Borjomi or Akhaltsikhe in Georgia. The Yerevan main bus station, Kilikya Avtokayan, is few kilometers out of the city center, connected with marshrutky. Part of the cervices land in Hyusisayin Avtokayan bus station, just next to railway station and Sasuntsi David metro station. For getting around, there is a huge amount of marshrutky lines in Yerevan, and finding out which van goes where can be a challenge. On the other hand, the city center is not too big to be seen on foot. Metro is especially useful between train station and city center. Ticket for a ride in city marshrutka or metro costs 100 AMD (around 0,20 €). Yandex taxis are handy and cheap, you can order a car to your address with an app, and there is clearly stated price for the ride to your destination. Our ride from Thailand Center to main bus station cost only 500 drams, so roughly 1 euro. 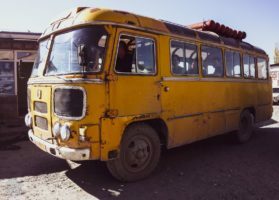 Overall, traveling in Armenia using public transportation is inexpensive, easy and safe. 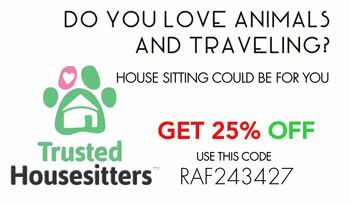 Have you visited Yerevan or are planning to? Share your thoughts in comments!